Home Events	Half the Places Taken Already for Defi Wind 2015! Friday, January 30 marked the opening of registration for Defi Wind Gruissan 2015. Within three days of registration opening half the places were taken already for this extraordinary sport event that puts in the limelight some 1000 windsurfers on the very same starting line! Born in 2001 from the association of Wind magazine and the town of Gruissan with the passion of Philippe Bru’s incredible organization team, this event remains so far the greatest worldwide gathering of competing windsurfers ever. 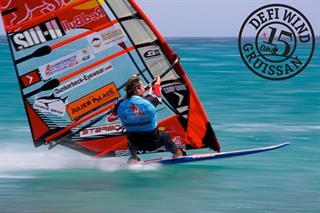 This impressing impulse has turned the Defi Wind not only into a worldwide leader in adrenaline-water-sports events but also into a universal not-to-be-missed windsurfing appointment. The Tramontane is waiting for you from May 14th to 17th.